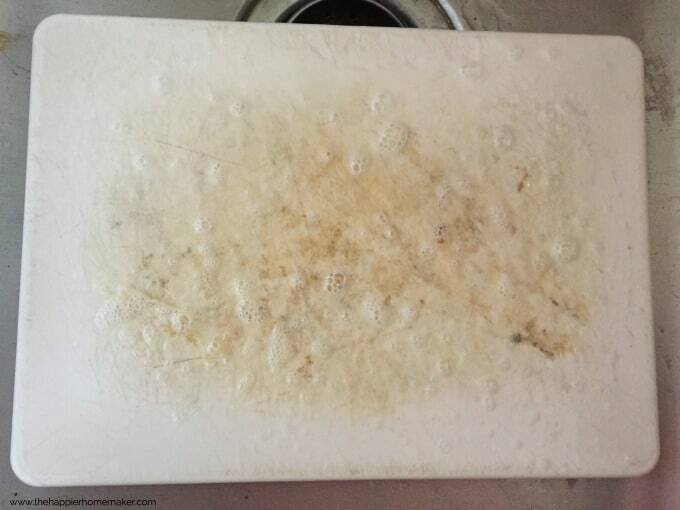 I was making one of my favorite meals the other night-Burrito Bowls-when I noticed that my plastic cutting board had some major stains, even after I washed it. A quick google search gave a lot of options for how to remove the stains but after trying multiple so called “solutions” without success I was getting irritated. 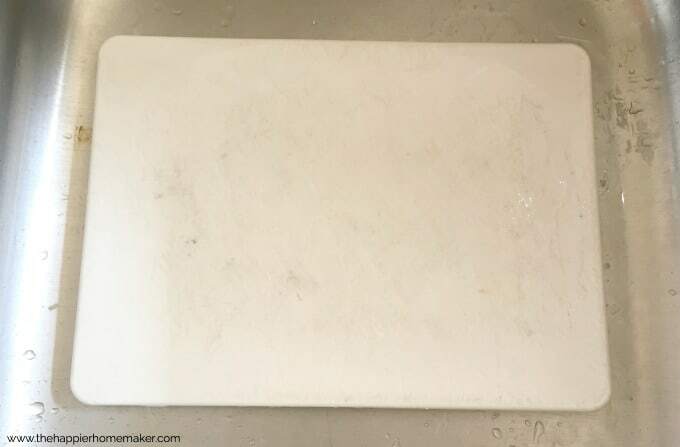 To combat the widespread misinformation I was finding I decided to share my results in hopes of saving you time when you need to remove stains from plastic cutting boards in the future! You might be surprised by the results! 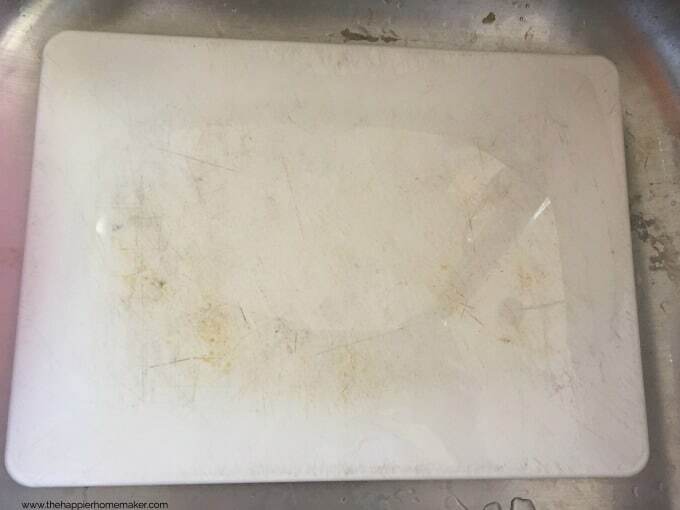 Real Simple magazine told me simply rubbing lemon juice on my cutting board and letting it soak would remove the stains. Nope. Nothing. I found this tip from One Good Thing by Jillee but unfortunately it didn’t work for me either. Granted she set hers in the sun after the oil was applied to help bleach it out and I wasn’t able to do that on a rainy winter day so that may be the difference. I’m a Young Living junkie so I had to try my favorite cleaner before I started looking at more traditional cleaners once I realized the more natural approaches weren’t working. Again, no change at all. I use this combo to clean a lot of things, including my kitchen sink, so I figured it was worth a shot since it’s such a great cleaning and deodorizing method. I thought there was a slight improvement but it was so subtle pictures didn’t even show it. Not perfect but a HUGE improvement. I decided to give it one more round and after that it came completely clean!! Yay!! The undiluted bleach was obviously the clear winner here. While I had hoped to find a more natural method sometimes you have to go the traditional route. 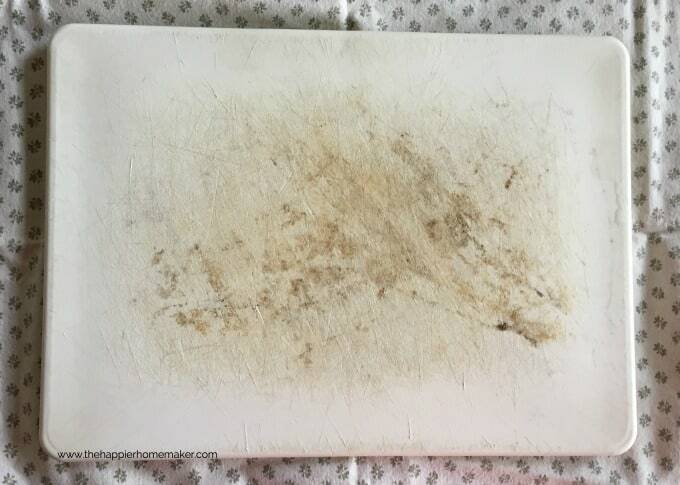 I know my cutting board stains were pretty severe (poor thing is over ten years old!) so I can’t say definitively that the other methods I tried won’t work with lighter stains but I know they were no match for mine. What do you think-do you have any other solutions I didn’t try? It looks to me that your cutting board needs to be replaced. All of the stains on the board represent deep cuts into the board which harbours bacteria that are trapped within the cracks. Bleach may be a temporary solution, but it might have to be repeated often. I agree Doreen, this was the first time it didn’t come clean in the dishwasher so it’s on the way out the door as soon I can buy a replacement! 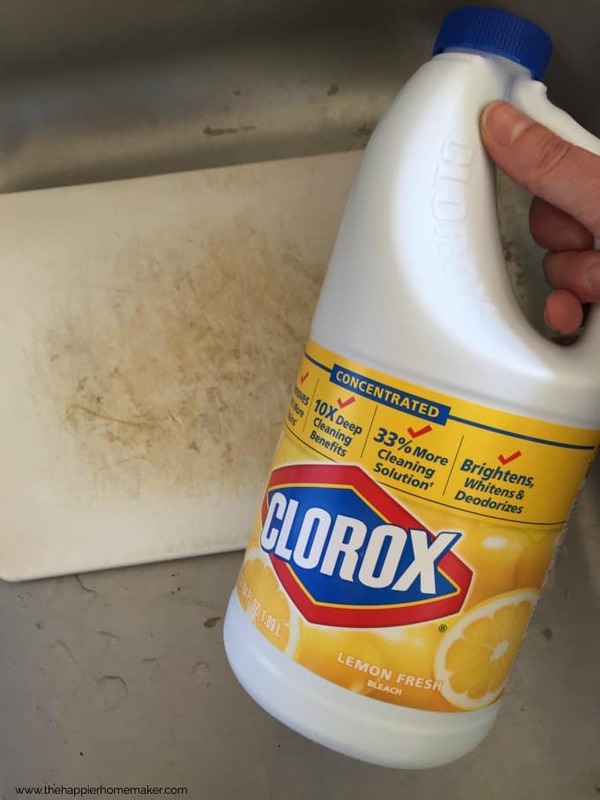 I use Clorox clean up and apply a paper towel and it work s famously. I do this on a very regular basis. Applying a paste of baking soda and hydrogen peroxide and leaving it for a few hours may work. Though bleach will be more powerful than anything else. I usually have it go through a washing in the dishwasher when it’s stained, It works. It did not work for me. Sandpaper. Just sit outside on a nice day and sand that puppy down. Start with coarse grit and work your way toward fine grit. It’ll be like new and get rid of those germ-harboring cuts, too. I used my steam cleaner. Just hot water. Works like a dream. Hey, thank you very much. Our cutting board is WRETCHED ! Happy holidays, and thanks again. bleach did not work either, still black streaks from cutting some veggies on it. I found that bleach mixed with vaking soda to make a thick paste works. Just add a cpl tbsp of bleach to a half or so cup if soda and mix. It should be really thick. Then leave it on for 15 mins and wash. I also use it around the tub when the caoulking gets stained. This worked better than I imagined. Looks brand new. I left it on for 30 minutes because I got busy and forgot about it. Working on side 2 now. THANKS!!! Great! I’m so glad it helped! 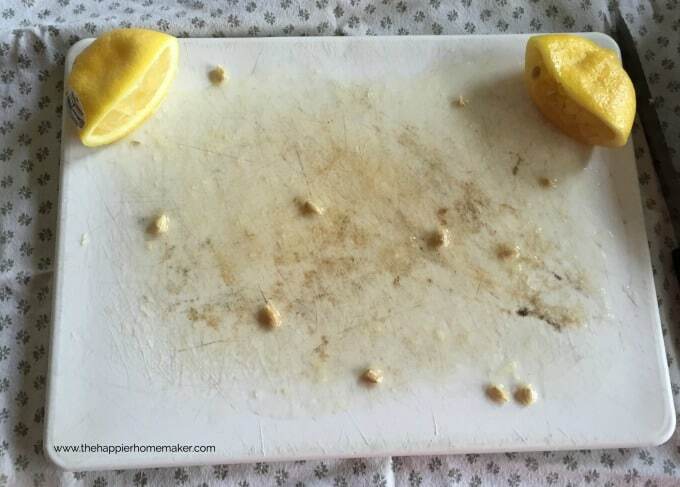 I think lemons are considered as the best for the removal of stains. What kind of bleach are you using? Straight bleach and several minutes of letting it “stand” on the stain always works for me. Orange from my carrots is a frequently recurring battle! 🙂 I use straight bleach for cutting boards and toilets. But that’s it. I don’t even use it for laundry! LOL! what of for shopping boards that arent white?